Convicted killers Ambrose Money and Andre Gouws were granted leave to appeal by the Pretoria High Court on Thursday against their life sentences for the contract murder of Chanelle Henning. 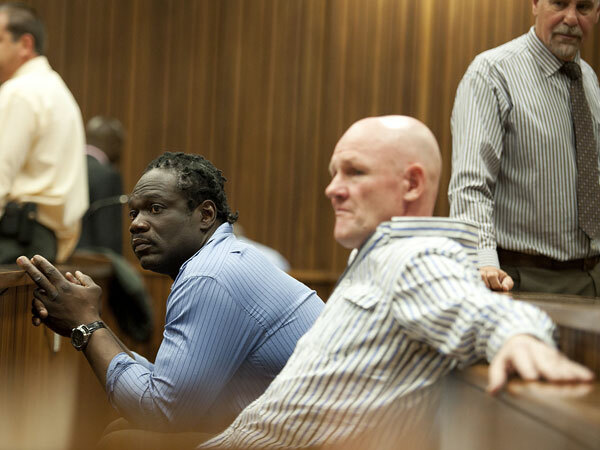 Judge Johan Kruger on January 5 this year described the two as callous, cold-blooded killers and sentenced them to life imprisonment despite their belated confession of guilt. Monye and Gouws only confessed their role in the young mother’s contract killing after they were convicted, but Kruger found they only did so to save their own hides and said he did not regard it as a compelling reason to impose a lesser sentence. This was despite prosecutor Gerrie Nel only asking for 20-year prison sentences. Chanelle Henning was gunned down by two men on a motorcycle shortly after dropping off her son at a creche at Faerie Glen in the east of Pretoria in November 2011. Former policeman Gerhardus du Plessis and his friend Willem Pieterse later pleaded guilty to the murder and were each sentenced to 18 years imprisonment. Her husband Nico Henning was arrested in December last year shortly after Gouws testified that Henning had offered him R1 million to murder his “troublesome” estranged wife, with whom he was involved in a custody battle. He is due to appear in the Pretoria Magistrate’s Court again in connection with a charge of murder on June 3, but no date has yet been set for his trial. Monye admitted that he had acted as middleman and roped in the hitmen for the murder of a woman he had never met after Gouws offered him R50,000. Monye and Gouws’ lawyers argued that their life sentences were shockingly inappropriate and could discourage other offenders from following suit by confessing. Both argued that the court should have found there were substantial and compelling circumstances which justified the imposition of a lesser sentence, especially in the light of the accuseds’ complete about-turn. It was argued that both had offered their full co-operation to the prosecution and the police to catch the master brain behind the contract murder. Jan van Rooyen, acting for Gouws, said his client was the only person to directly link the alleged master brain to the crime and his evidence was vital for the successful prosecution of the alleged culprit. This in turn dictated that it was in the interest of justice to encourage any accused to tell the truth and to willingly assist in the investigation of crimes, he argued. He argued the court had not sufficiently taken into account the unique circumstances of the case or that Gouws had shown genuine remorse for what he did not only by saying so, but also by revealing the truth. Monye’s lawyer Matthew Klein submitted that the life sentences imposed in the case closed the door for future similar cases where an accused could tender co-operation with the police. Kruger said the State’s request for 20-year sentences was clearly based on the envisaged prosecution of the alleged main instigator. It was quite understandable that the successful prosecution of the person might to a larger or lesser extent depend on the accuseds’ co-operation. However, he said in his view the court was not bound by undertakings which might or might not have been given to the accused and could not be guided by what remained a sheer hypothesis. He was still of the view that the men’s confessions did not constitute substantial and compelling circumstances but could not exclude the reasonable possibility that a court of higher standing could hold differently on the issues in the case. Given the gravity of the matter, the severity of the sentence and the relative novelty of the questions on which the court had to decide, it was fair that another court should have the final say on the fate of the accused, Kruger added.